I’ve been doing a little research into microstamping. High emotions on either side are not productive. I’ve tried to gather facts and sources for your own research. This was instigated at the suggestion of Justthisguy in the comments. 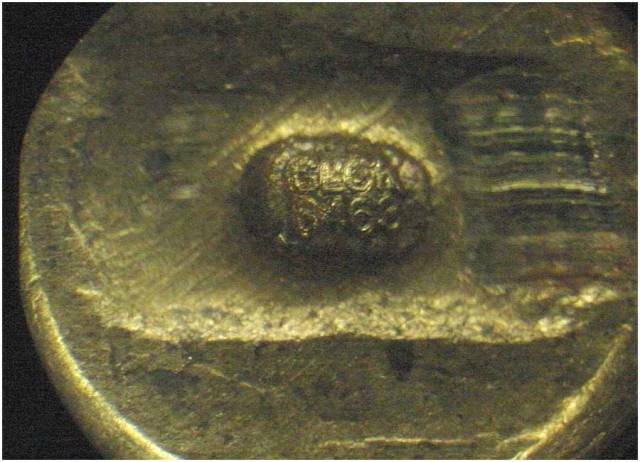 First off I would like to point out there are two types of microstamping. Neither of which should be confused with “ballistic fingerprints”. “Ballistics fingerprints” are a system where law enforcement obtains a bullet and cartridge casing from the manufacture for every new gun. Maryland and New York have passed laws requiring this and at last check not a single crime had been solved with this additional data and Maryland State Police were advising the money should be spent on something more effective. This concept is about putting matching serial numbers on the bullet, shell casing, and bullet box. Of course there would have to be a database that tracked the bullets from manufacture to the end user. It is impractical for many reasons. I don’t expect this to go anywhere in the immediate future. This is about putting unique codes (essentially a serial number) on the firing pin, breach face, ejector and extractor. Typically you will hear the example of the firing pin being marked but actually there will be markings in other places as well. Some people pretend it’s a secret where these markings will be. Anyplace that strikes or presses against the shell casing is a potential location for imprinting the codes. This includes inside the chamber but those marking are at high risk of being sheared or smeared away in semi-autos during the extraction while there is still some pressure in the barrel and casing. These codes will correspond to the serial number of the gun. The manufacture of the gun will be required to cooperate with law enforcement to find the distributor->retailer->initial buyer — just like current firearm traces when law enforcement has the make, model, and serial number of a firearm. This technology poses the greatest potential to be generally implemented and California passed such a law on October 13, 2007. This law mandates the technology be used on all new firearms sold in California beginning on January 1, 2010. It requires the microscopic codes be put in two or more places such they are transferred to the cartridge case. For more information see Wikipedia on microstamping. The claimed benefit of the proposed technologies is the promise of making it easier to solve crimes committed with firearms. The arguments against the use of the technology center on the ease of a criminal defeating the technology, the difficulty of manufacturers implementing it, the risk of innocent people being framed, and the increased costs to all gun owners. Gun control advocate appear to be in favor of any restrictions on firearms and are in favor of all of the technologies. See also microstamping webpages for The Coalition to Stop Gun Violence and the Educational Fund to Stop Gun Violence and their PowerPoint presentation. This report on a paper from UC Davis provides some support for the case against microstamping of firearms but probably made a lot of errors and should not be considered strong evidence for the case against microstamping. The National Shooting Sports Foundation, Inc. has a document on microstamping that outlines the problems from the manufacturer’s viewpoint and the Association of Firearms and Toolmarks Examiners, and that it will not reduce crime. Other documents I found on the NSSF site probably have serious flaws and shouldn’t be used as reference material. I am not sure a defensive strategy to protecting rights has ever worked. A proactive stretgy always keeps the fight off in the distance. Microstamping does not change the status quo, all data is at the manufacturer. No registration, no licensing and no imaging. 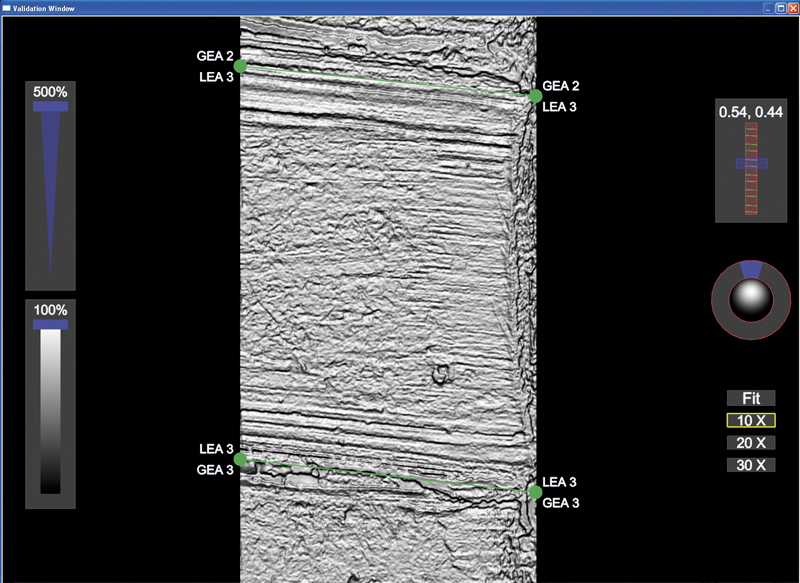 What many people are not aware of is there is a new 3D mapping imaging system being produced. We helped successfully defeat ballistic imaging for new firearms, however the ATF and its vendor are not giving up, the ATF has a $500 Million system in place for linking current ballistic imaging data from crime labs. The company who built that system, located in Quebec, needs to expand its market, it needs to capture the new firearm market. The old system they built can not accurately imaging new firearms, however it is possible for the new 3D system to work at a much larger expense. Microstamping neutralizes the need for imaging all togther. In the end I am for being proactive, instead of being reactive. If you want to see how bad it could really get, google 3D ballistic imaging and see how costly that system will be, since that system will require all info on the pruchaser and firearm to be entered into a government controlled criminal database. I am not sure most people understand this fact. 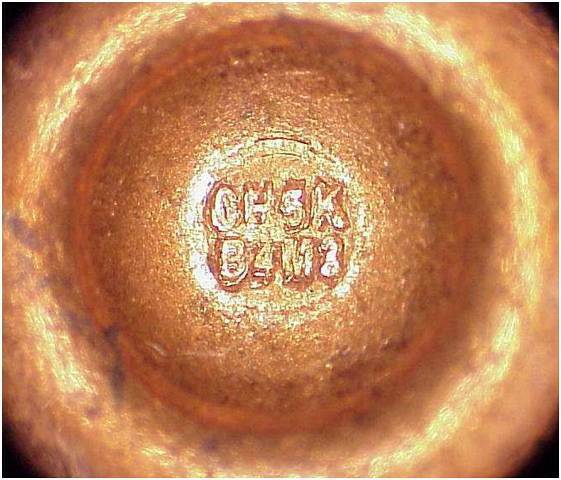 Microstamping is a perfect technology — completely benign and all data remains at the firearm manufacturer. In essence of what he is saying is the alternative to microstamping the firearm is a much more expensive version of the “ballistic fingerprint” system implemented with better technology and the associated additional databases. Because no new database is required, only an additional entry in the manufacturer’s database with the serial number, firearm microstamping gets around a number of the arguments against “ballistics fingerprints” and bullet/casing microstamping. For this reason I expect the anti-gun people to push this technology the hardest and have the most success with it. The best argument against microstamping of firearms is the manufacturing process does not lend itself to serialization of multiple parts. The firing pins are made by some supplier, the extractors, ejectors, and slides by other companies. The manufacture of the gun itself may just assemble the pieces. Each of the serialized parts must be matched with the frame that has the actual official firearm serial number. The code on these serialized parts are not visible without a microscope and all would have to be verified and recorded in database during the assembly process. This will make it expensive and error prone. This argument will not gain much traction with the anti-gun people because increasing the expense of firearms is not regarded as a problem. The next best argument is probably that criminals can easily defeat the technology. This seems indisputable. Changing of firing pins, extractors, ejectors, and barrels is commonplace in the gun community. A few minutes with an grinding stone on a Dremel tool will obliterate the laser etching without affecting the functioning of the firearm. The counter arguments are somewhat weak; 1) Criminals aren’t very smart; and 2) There are redundant markings. The framing of innocent people is probably the weakest of the arguments against firearm microstamping. The powder residue and other forensic evidence will eliminate most planted shell casing from the real shell cases involved in the crime. Multiple stampings from reloaded shell cases also are probably easily eliminated with the available forensic evidence. It will slow down the process however, but probably no more than it would if they were to do it with existing forensic technology and this appears to be a non-problem. Of course this assumes the prosecutors and law enforcement are forthright and trustworthy in dealing with the evidence. I am inclined to believe this is generally the case but the actual instances of unethical actions of our government officials is much higher than I am comfortable with. 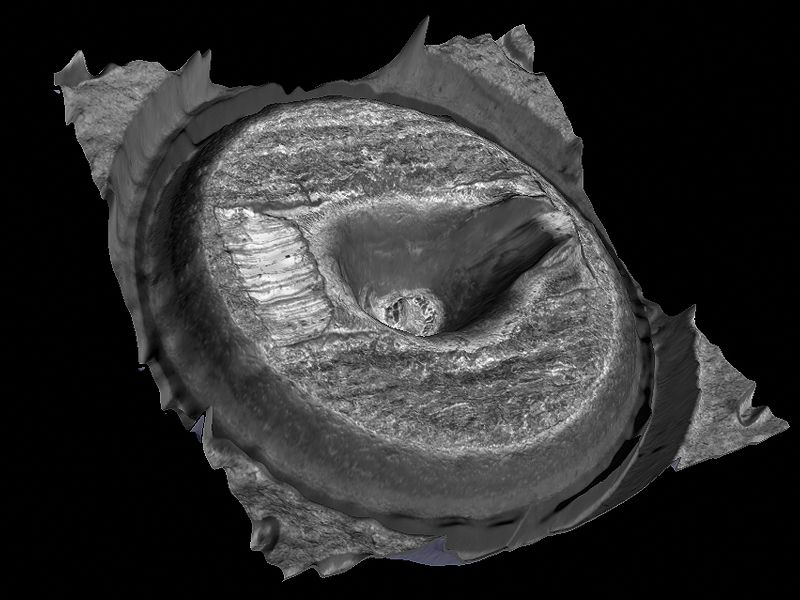 The following pictures are from Forensic Technology and show the level of detail possible with modern microscopes. Primer after 2500 rounds through a Thompson SMG. Glock firing pin after 1400 rounds (image reversed). Primer from a Glock after 1400 rounds. 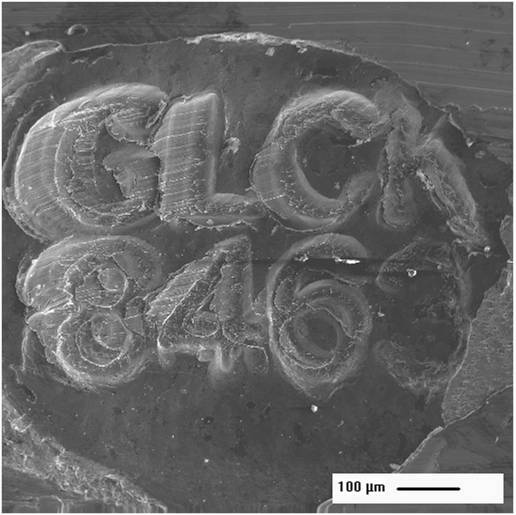 Scanning Electron Microscope (SEM) image from Glock showing smearing of the primer. This entry was posted in Ballistics, Gun Rights, Technology by Joe. Bookmark the permalink. Joe, the text file doesn’t wrap for me (in Firefox). Might want to convert it to HTML just for readability. I pasted it into a text editor and turned on wordwrap and read the whole thing. I know I ain’t the most best spellur out there, but… uh… jeez. Anyway, I can actually understand the “salting the crime scene with range cases” scenario and agree that’s not a valid issue. However, I do have the fear that as a reloader, I’ll be tagged since I spend quite a bit of time foraging on the ground (shooting 10mm, I have to wade through billions of .40 cases). I think this will put undue burden on us reloaders. I also agree that most criminals are not gun experts and the modifications to the firearms are going to be rare. But it doesn’t take much to fool this system. I’ll never buy a microstamped firearm, ever. There’s 270,000,000 of them out there right now and I’d rather spend the extra money for a used, nonstamped on, that ever give money to a company that does do it. And unless we band together and inform the manufacturers that we won’t support them unless they support us, then old firearms are all that will be left for us. Mr. Lizott has a lot to gain by gaining our trust. And just because there are worse things out there doesn’t mean we have to give in to the least-worst. This is nothing but a ploy to increase the costs of firearms or drive manufacturers out of business. And I don’t trust anyone who has money to be made on this. What are your views on it? Your article remains fairly neutral (which is good). Yeah, I need to reformat it. I was in a hurry because I promised my wife I would go on a walk with her and I keep telling her, “Just a couple more minutes”. I’ll reformat it tonight. My views… I’m with STI on this one for now. I just did all the research today and have to sleep on it before forming a solid opinion. OK, assuming a murderer is going to comply with all that in spite of the fact that there are millions of non-stamped guns, and in spite of the fact that he could be smuggling cheap ones in from other countries along with his drugs; he leaves the brand new, stolen gun behind and the dealer or the regular gun owner gets blamed for not “properly securing” his inventory. Same old story. This has nothing to do with law enforcement. And how many time do I have to fire and clean my pistol before the microstamping becomes unuseable for our intrepid crime fighters, I mean we’re talking what, a few thousandths of and inch right? I ran afoul of the Maryland program years ago, had bought a used pistol from a friend who had bought it new in Maryland. They wanted to retest the pistol and didn’t like being told to “get a search warrent”. It’s hundreds of millions, not just millions. Depending on the surface which we are talking about two to three thousand firring are not sufficient to make the microstamping unusable. To the best of my knowledge no one has done tests beyond that number. Of course the lifetime of a good quality firearm is at least 10,000 rounds so one can safely say the microstamping has not been sufficiently tested in this regard. I don’t know how they can know this but it is claimed that most guns used in crime have been fired less than 100 times. How many hours after the first microstamped gun is deliver will an enterprising criminal set up shop with a dremel tool and offer a cleanup service? All I can see microstamping do is to raise the cost of firearms, something I am sure the anti-gun crowd wants. But as a crime fighting tool it will be totally useless. Ron, it may help in a case or two every month, but make no mistake, this is simply a ploy to increase the costs of firearm manufacturing. Period. I’d like to see someone tell the government since they’re the ones benefiting from this technology that they incur the costs associated with it. Then watch it get dropped like a brick. The fact that the concept of micro stamping arms or munitions is impractical,unnecessary,expensive or useless is irrelevant if it gets legislated into being.If legislatures reject this now,certain groups will promote it again under a different guise that we must be vigilant for. One of the best arguments against microstamping is that anything that encourges the criminal use of shotguns over pistols will harm the innocent much more than anyone will find desirable. Then there’s the fact than in all the last several mass shootings, micro-stamping would have been usless– the perp offs himself at or near the scene, or is taken down by a defender. It takes less than minute to remove and replace a Glock firing pin, from assembled gun to loading and firing the reassembled gun. And there’s the key– if this goes through, at some point the manufacturers of parts and accessories will have to be registered and will have to acquire this technology, putting some of them out of business and placing yet another hurdle in front of entry into the business. In any case, it’s better to push for more pro-freedom bills and leave the antis scrambling to respond to us. If the pros would stay on offense, the antis could be cut off at the knees before they know it. You have more faith in prosecutors than do I. I fully believe that if a cartridge case for a .454 Casull was found at a fatal knifing the prosecutor would try his damnedest to bamboozle a jury into convicting the purchaser of the firearm even though he could prove he was in Egypt at the time of the knifing and that the firearm in question was reported as stolen fifteen years ago. Easy ways to defeat microstamping- use a revolver. Steal the gun you use in the crime. Buy your gun on the black market. Buy your gun outside of California. Buy a pre-stamping era weapon. It’s just another ploy by hoplophobes to chisel away at the RKBA. A few months after this is passed into law, if it ever is, and we find that it has a minor effect on crime- most criminal guns are bought on the black market anyway so any serial number database will be useless- there will be a demand for some other form of control. In the end that’s what this all boils down to- control. They don’t want free men and women to be armed period, and they’ll do everything they can to make it as difficult and expensive as they can for you to be armed while they work towards a complete ban on firearms altogether. One step at a time; sniper rifle ban, AWB, ammunition bans, etc. It won’t stop- not when your guns and ammo are marked with serial numbers, not when you have to apply for a permit to buy each and every gun, not when there’s a database of all gun owners- these are all intermediate stages on the way to banning virtually every gun they can. US gun-owners need to be aware of this; each time the hoplophobes win a victory, it enables them to move one step closer to their ultimate aim. As such, they need to be vociferously opposed at each and every opportunity. Right now, I should be hearing about every single firearms manufacturer refusing to do any business with the authorities in California just like Ronnie Barrett did. If the manufacturers and gun owners don’t get really serious about this then in the not-too-distant future the US will not be so much more different from the UK as far as firearms laws go. At the beginning of the last century British bobbies chasing criminals requested guns from passers-by to use against the bad guys; and they got them. Children’s author of yesteryear Beatrix Potter commented on a hotel she stayed at where only one of the nine or so guests was not carrying a revolver. Fast forward to now and the British people are subjected to rigorous licensing for the few types of firearm they are allowed to buy- and no one except the police is allowed to carry or even use a gun in self-defence. In a relatively short period of time a series of ever more restrictive laws essentially killed off law-abiding gun culture in the UK. Shooters are a tiny minority now. Criminal gun culture, however, has thrived.